In general, I’m not a fan of recipes that call for the use either only egg yolks or egg whites as it means I’ll be scrambling (no pun intended) to look for some way to use the remaining egg parts. Nonetheless, there are certain things that I do like to eat and make such situation unavoidable, so I’ve coupled some recipes with complementary use of eggs. On days when I make carbonara or lemon curd – calling for egg yolks – this friand recipe comes out to play. 1. Preheat the oven to 170°C, and line mini cupcake tray with paper cases. 2. Combine the dry ingredients in a mixing bowl. 3. Mix the wet ingredients in, until just combined. 4. 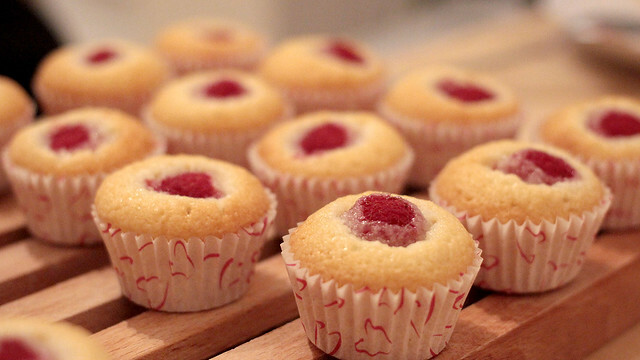 Spoon into paper cases and top each with a raspberry (plus flakes, if used). 5. Bake for 10-12 minutes, till golden and skewer is clean. 6. Leave to cool a little and enjoy the treats! On occasion, when I am in a hurry, I would even pour the batter into a 4-5″ lined baking tin, studded with raspberries on top, and ended up baking a small cake instead. When in season, strawberry makes good substitute, and while chopped pear makes delicious friands too, the colour just doesn’t pop the way raspberries or strawberries do.